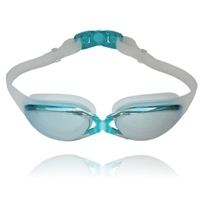 Swimming Goggles – Shatterproof and Waterproof – UV Protection – Anti Misting – Comfortable – Non-Allergenic. 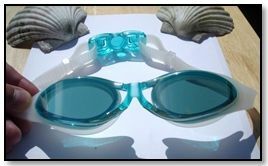 Premium Silicone Swim Goggles for Men and Women Swimmers. Very Low Leak and Anti Misting Features. Mirrored UV Lenses To Stop Glare From Intense Light Sources. Our goggles don’t only look great, they have many features that put them at them at the forefront of goggle technology. The stylish lenses are made from polycarbonate (PC) plastic. This means that they are strong and have a high impact resistance. The inside of the PC lenses have a layer of anti-misting agent. This must not be touched or the coating will not perform effectively. Simply wash in soapy water and rinse well with fresh water after your swimming session. The outer lens has a mirrored coating to stop any glare that may occur from strong indoor lights or from sunlight. This ensures that they are 100% UV protective to your eyes. The lenses are shaped so that you will be able to view a massive 180 degrees visibility. The eye gaskets are made from soft premium grade silicone. This makes them very comfortable to wear for long periods of time. Silicone is also hypo allergenic so you don’t have to worry about any allergies. Because the silicone is so soft and flexible, they will form a perfect seal around your eye socket that keeps water out very effectively. The straps once again are made from soft silicone granting you a snug secure fit. The buckles are made from polycarbonate again and designed as a one touch quick release system so that you can undo the buckle quickly. You will also receive your goggles in a case that you get free of charge. This will prevent them from getting scratched and damaged whenever you are carrying them around with you. Swimming goggles aren’t just for show. Our eyes just aren’t intended to work well in the water. 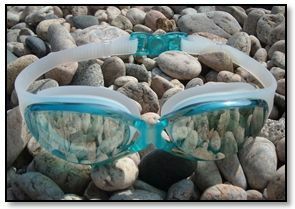 It’s fine if you are just having a fun time in the sea but for any swimmers that want to do many laps, swim goggles are an essential piece of equipment. First of all, you need to see where you are going. If all you can see is a blur, then that is not ideal. You don’t want to be swimming into anything like a rock or a pool wall or somebody else. Competitive swimmers also need to know where they are in the race to pace themselves. The other thing is, swimming any amount of time in a pool that has been chlorinated just isn’t very nice for the eyes. They soon get sore. Even sea water after a while can start to irritate the eyes. So, to make sure that your vision is great under water and to prevent irritation from pool chemicals, wearing a pair of swimming goggles is an essential requirement for all types of swimming. 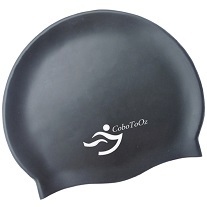 If you are looking for some headwear to go with your goggles, you may also be interested in our swim caps.